A 71-year-old male is a bruxer. His upper left fixed partial denture was lost 4 years ago (Fig.2). 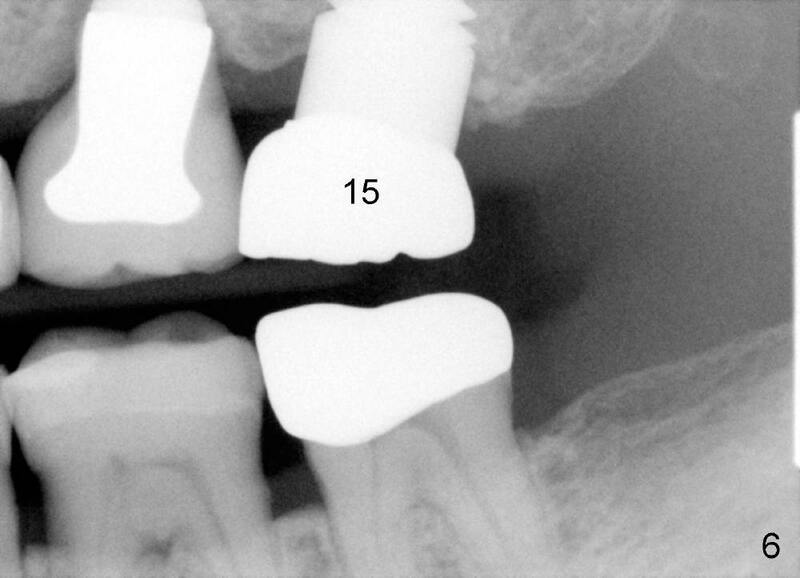 It is replaced by an implant (Fig.3: #14) and two single unit crowns (#13,15). 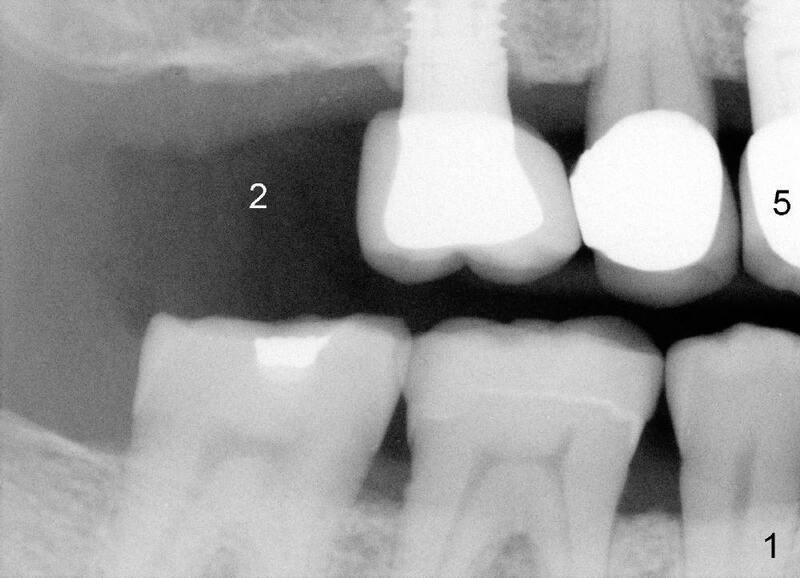 One year later, the tooth #5 is replaced by an immediate implant due to crown fracture (Fig.1,4). 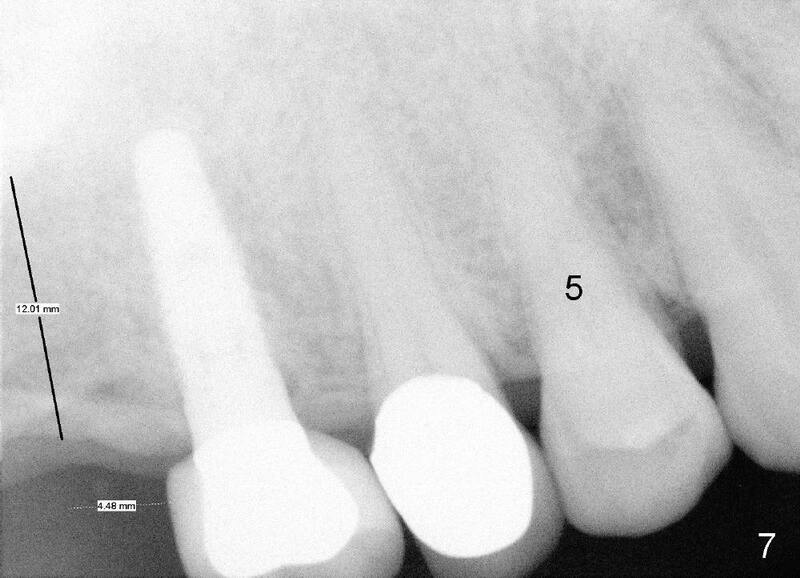 Six months after the cementation of #5 implant crown, the tooth #15 is restored by an immediate implant due to root fracture (Fig.6). Recently, porcelain chips off the PFM crown of #13. The patient finally agrees to have another implant (Fig.1: #2) to make his dentition complete and distribute masticatory force more evenly. 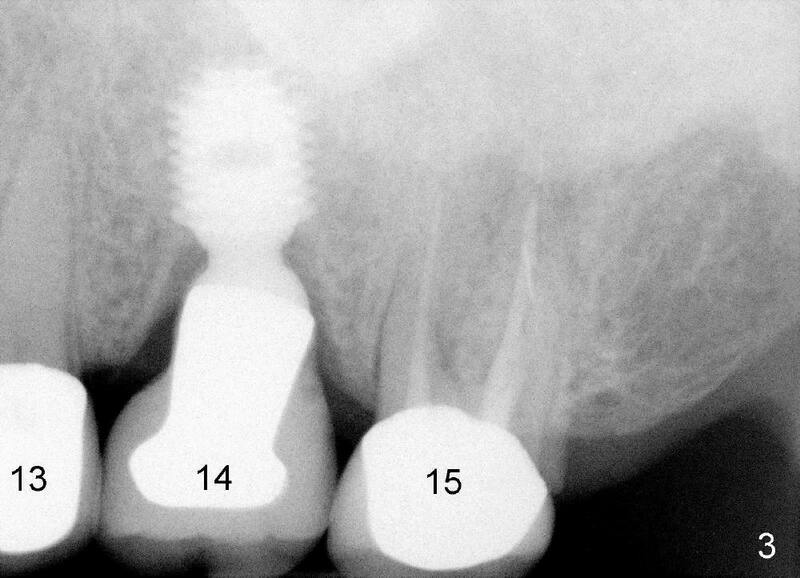 The advantage to place implants for a bruxer is that there is sufficient bone height (Fig.2-4). The bone density also appears to be high; there is a thick cortical bone in the edentulous ridge of #2 (Fig.4 arrowheads). Incision will be made; suture may be required for flap fixation. 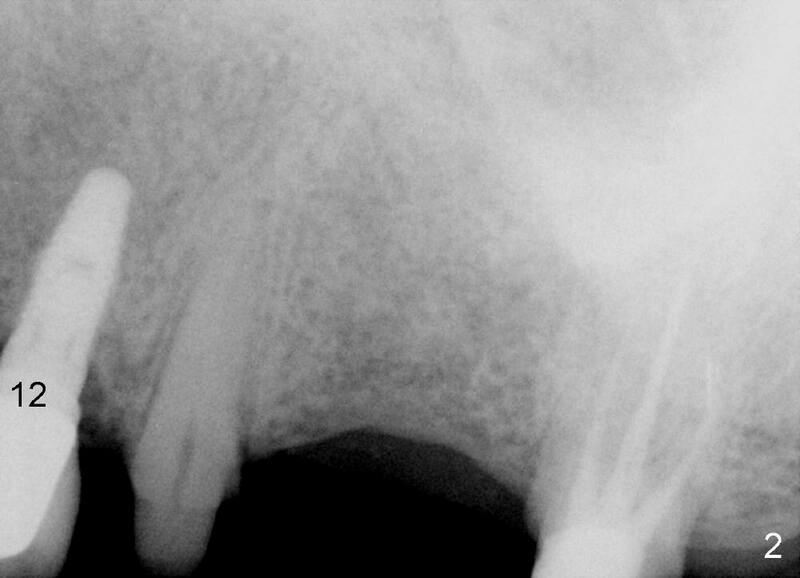 Osteotomy is initiated by 2 mm pilot drill 4 mm from the neighboring tooth (Fig.5); the depth is 8 mm. The depth of the osteotomy is adjusted according to X-ray taken with a parallel pin. Sinus lift may be needed (Fig.5 dashed line: sinus floor). The density of the cancellous bone will be felt and determined while using the 2 mm pilot drill for initial osteotomy. If the density is high, Bicon reamers will be used for further osteotomy and bone saving. Otherwise, osteotomy will be finished mainly with Bone Expander Kit or osteotomes. Bone-level implant is used, followed by a healing abutment. Decortication will be done with a surgical handpiece with a fissure or round bur. If no suture is used for flap fixation, perio glue will be used to close the incision without perio dressing. If the wound is not approximated each other well with sutures, perio glue can be used for complete seal. Further search of the patient's files finds X-ray taken prior to #5 extraction (Fig.7). Bone height is estimated 12 mm. Since the mesiodistal width of the 1st molar is less than 10 mm (Fig.8), the center of the osteotomy at the site of #2 should be 4.5 mm (3.5 mm from the 2 mm pilot drill). 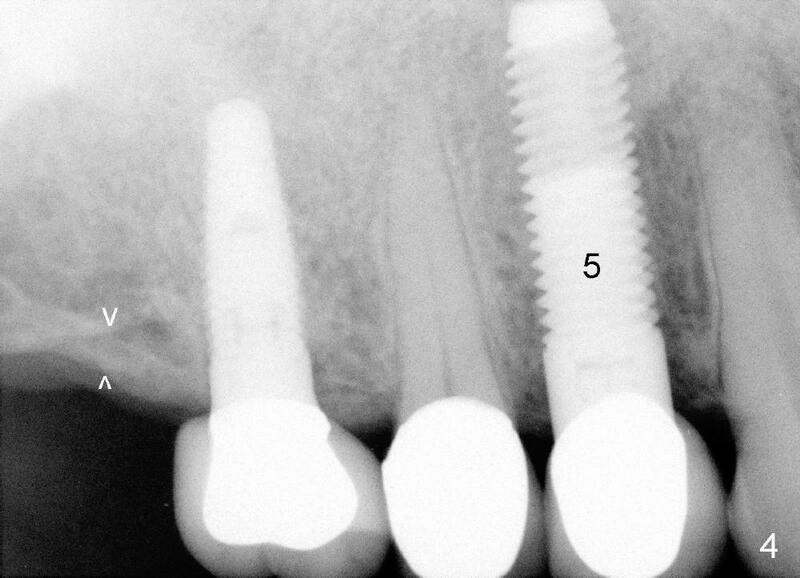 If the bone allows, 5.3x12 implant will be placed.